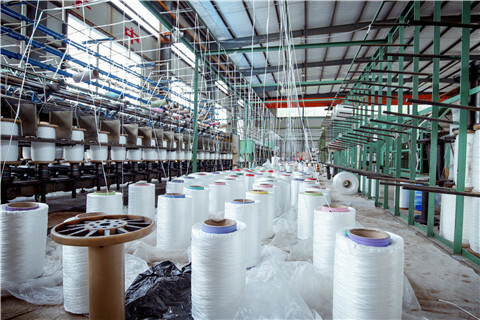 Yangzhou Jushen Rope Cable co.,ltd. 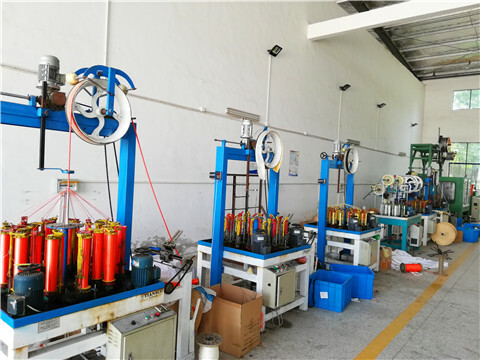 (hereinafter called Jushen) was recombined and founded in May 2005, with registered capital of RMB32,399,370.00 and actual investment RMB63,000,000.00 totally, it covers an area of 15,000 square meters for the whole manufacturer, there are 69 staffs in the company. 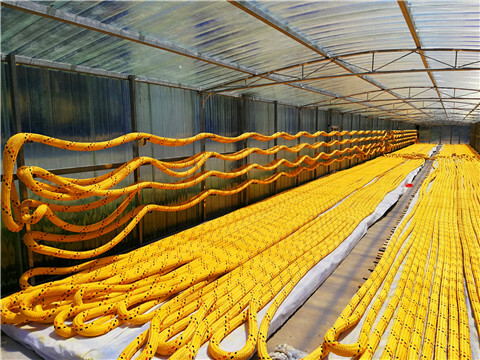 Jusheng has two trademarks: "Jushen" and "Run Yang", designed production ability of mooring ropes is more than 8,500 tons annually, it has the modern, standard, full automatically mechanized workshops and pioneer inspection facilities. 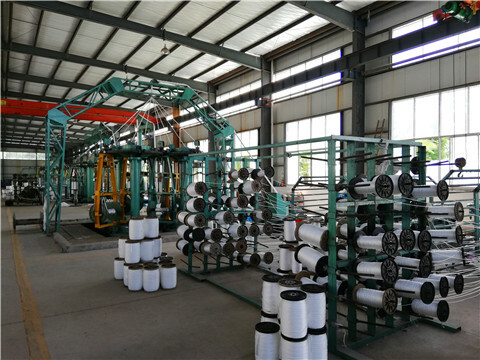 "Run Yang" ropes, which is applying international standard and with various products and full specifications, such as Nylon, Polypropylene, Polyster, Spandex, Aramid fiber, Polymer polyethylens fiber, braid of 3, 4, 6, 8, 12, 16, 24, 32, 48 strands and double braided, sizes is from dia. 3mm up to dia. 220mm for your option. 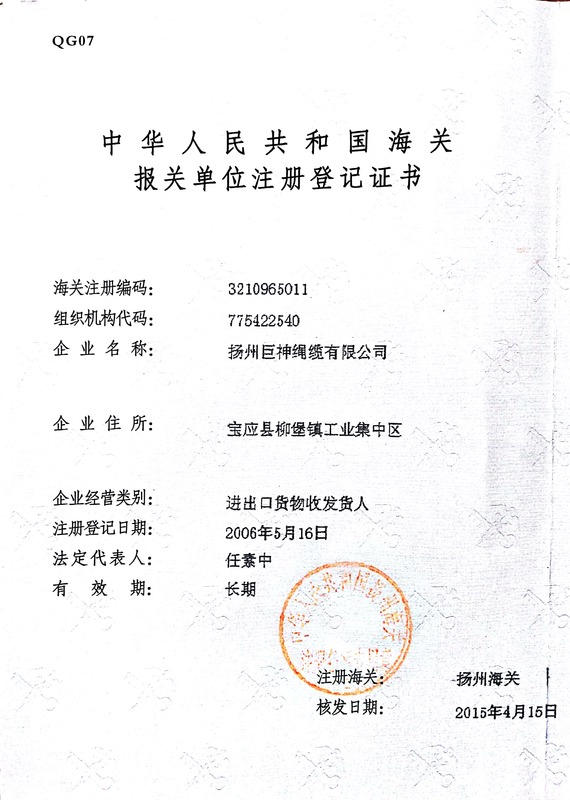 Jushen has achieved ISO9001:2008 in accordance with Quality Management System of CCS and GJB900B-2009 with certificates. It has obtained the plant certificates of CCS, GL, BV, NK and DNV, and it will be able to obtain the certificates of LR, ABS, KR, RINA etc. according to client`s requirements. Nowadays, Jushen has got the membership of China Shipbuilding Industry Association and has been their authorized supplier and collaborator. It has already been the most professional and powerful manufacturer of mooring ropes in China, products of "Run Yang" and "Ju Shen" ropes are widely used on board oceangoing ships and offshore facilities, at wharfs and terminals, as well as in sports and military area, clients are from all of the world: USA, Korea, Japan, Singapore, Europe, South America etc. We do promise to offer all our clients with best quality and service under the business philosophy Integrity-based, Customer first" and create a bright future together with all our collaborators. Yangzhou Jushen Rope Cable CO.,Ltd.